3/1/2009 – In the last week we brought you two spectacular puzzles taken from the Corus Studies Day in Wijk aan Zee, and we also reported on the 2009 British Problem Solving Championship, presenting three problems from that event. Naturally all of this without revealing the solutions, which we do today. Prepare for some unbelievable lines and unique positional ideas in these celestial solutions. In our previous report Yochanan Afek provided us with two spectacular studies from the Corus Study Day. The were published in The Problemist and we had permission to reproduce them. Game over? Not quite! 4.f4!! Closing for a moment one diagonal, thus gaining precious time to open the longest one for the final combination. 4...Bxf4+ 5.Ke2 Bxc1 6.Ne5! h1Q 7.Bc6 Qh3 8.Bd7! Qg2 9.Bc6. There is one more beautiful Reti-Memorial study, composed by Yochanan Afek, that we are waiting to show you. But it needs to be published in a problem magazine and submitted for competition first. In a helpmate, Black moves first and both sides cooperate to help White mate Black. In a helpmate in six, this mate takes place on White’s sixth move (thus both sides play six moves). In the second part of the problem, you have to move the black queen from a3 to e8 and again find a helpmate in six. The solvers found this problem one of the hardest in the competition and only the two over-the-board GMs managed to solve it completely. a) 1...Qd6+ 2 Kc4 c5 3 Kb5 Ke5 4 Nd7+ Kd5 5 Ka5 Kc6 6 Ka6 Bd5 7 Nb8#. b) 1...Kf5 2 Nd7 Ke6 3 Nc5+ Ke7 4 Ke5 Bd5 5 Kf5 Kd6 6 Kf6 Qd7 7 Nb7#. 1.h3! (one point for the key, which threatens 2.Be6+ Ke4 3.Bxc4+ Kf3 4.Bd5#; one extra point for giving this threat up to 3.Bxc4+). 1...Nd3 2.Bc3 (threat 3 Nf6#) 2...bxc3 3.Nf6+ Kd4 4.Re4# (one point for giving this up to 3.Nf6+). These two defences were both refuted the same way. In each case, Black’s first move blocked a square which his king would need in the future. In both lines, White sacrificed a piece to create a second block for the king; these sacrificial moves involved the white piece crossing the square on which White would give a check on the third move. 1...Rd2 (blocking d2) 2.Re5+ Kd4 3.Rxe1+ (half a point for giving up to here) 3...Kd3 (or 3...Kd5 4.Be6#) 4.Nxb4#. 1...Re2 2.Rxe2 (threat 3.Be6#) 2...Ne3 3.Rxe3 (half a point for giving up to here) followed by 4.Be6#. For today's astronomy picture, we travel a bit further from home, eleven million light-years to be precise (or in fact imprecise, as the distance is not known to any great accuracy). 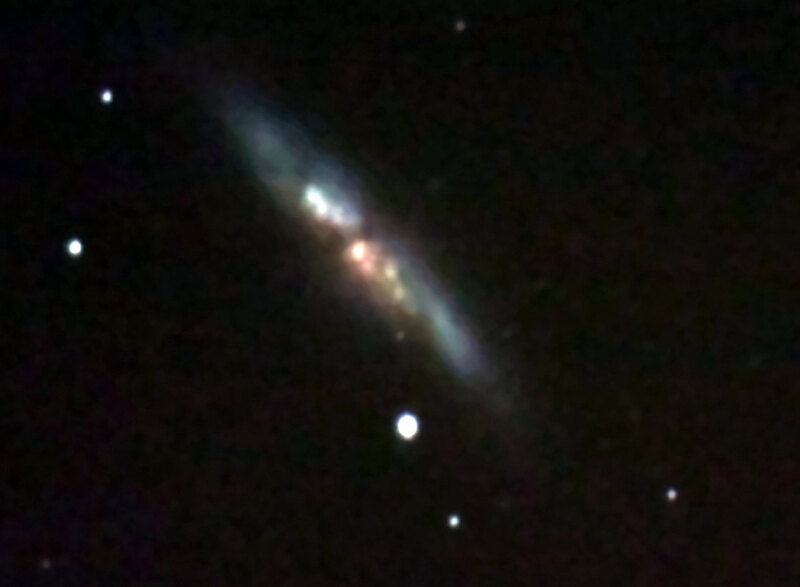 This is the galaxy M82, sometimes known as the Cigar Galaxy. The irregular knots and dark lines visible in the photograph show that something is happening in M82, and a Hubble picture shows more clearly that there are great jets of dust and gas streaming out of the centre of M82. The reason for this is that in the recent past (which here means about 600 million years ago) M82 nearly collided with the massive spiral galaxy M81. The gravitational pull of M81 disrupted M82's structure and triggered a massive burst of star formation, the effects of which we can still see today. The above picture was made using my 10 inch Meade LX200 GPS telescope. – John Nunn.